Laminitis is a stagnation of blood in the hoof. Herbs in this ancient herbal blend are used to cause a movement of blood in the lower extremities and to tonify the blood. Stagnation of blood or Qi in any part of the body causes a severe stabbing pain. Stagnation of blood and/or Qi in the hard horny capsule of the hoof is extremely painful. The herbs of this blend move blood out of this hard capsule in attempts to minimize damage to the delicate structures within the hoof. Laminitis is a stagnation of blood and Qi within the foot due to a number of underlying reasons (retained placenta, endotoxin release, hard footing, grain overload, etc.). The primary reason for the stagnation of blood in the hoof needs to be determined and resolved. Movement of blood and Qi should be smooth and even throughout the body for health. A stagnation or uneven movement causes disease and with it accompanies pain. Wherever there is stagnation, there will be pain. Also, when stagnation of any body substance occurs, there tends to develop heat, similar to the grinding of a wheel and the friction and heat that would be generated. The valuable herbs of this blend are designed to move blood and Qi in the lower extremities. By moving the blood, heat, inflammation and pain will diminish within the hoof. Traditional Formulas: Administer two (2) tablespoons twice daily for the initial twenty days. Then, administer two (2) tablespoons once a day until laminitis or heat to the hooves has resolved. Note: In the event the horse refuses to eat herbs, start with small amounts in the grain until the horse is acquainted with the taste or try the Flax Plus version of this formula. Almost all horses will eat the herbs in their grain. Flax Plus: Administer one (1) scoop twice daily for the initial twenty days. Then, administer one (1) scoop daily until laminitis or heat to the hooves has resolved. Six tablespoon scoop included. Precautions: Not to be used in pregnant mares. Laminitis is a serious disorder and can be life threatening. 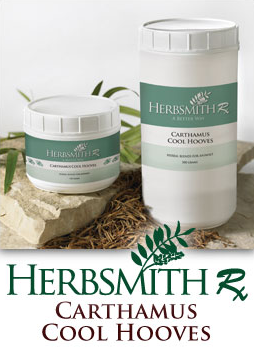 This herbal combination should be used in addition to, but not a substitute for, veterinary care.